Are you ready for the fast-paced digital and communication world? Become a digital content creator, digital media strategist, branding account executive, communications manager or advertising champion. Build identity and design original content with… branding strategies, advertising campaigns, storytelling, photography, video production, webs, and apps, TO Create transmedia exposure via media planning, PR, Digital marketing (SEO/SEM), social media strategy, and audiovisual content within corporate social responsible boundaries. If you like to write, have a creative flair, enjoy problem-solving, thrive on pressure and in a fast-paced environment, the fields of advertising and public relations might be for you. Whether you work for an independent agency or within the marketing division of a large corporation, you will have the opportunity to shape how the public views your client. The fields of advertising and public relations are ideal areas for liberal arts graduates. They call upon your abilities to be a keen observer of the population at large, synthesize public opinion, work well in a team environment, write well, be an articulate and effective public speaker, and maintain a positive and high-energy profile within the workplace. 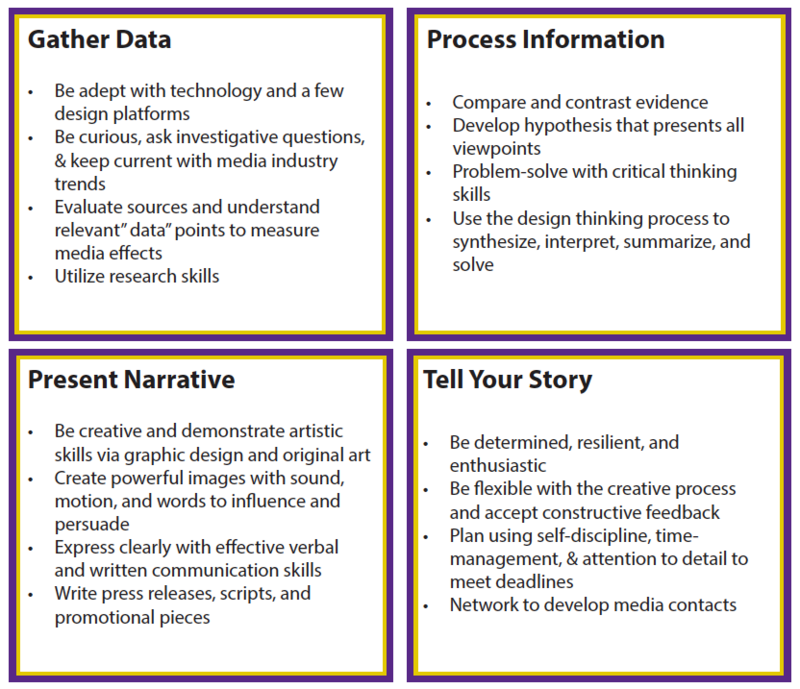 Many Williams students possess these traits, skills, and talents, especially those who have chosen to concentrate on the humanities and social sciences. Structure of the Advertising Industry: It’s always good to start with the big picture. This article will give you a great overview of how the advertising industry is structured. Smartbrief from an alum, "I would recommend subscribing to Smartbrief's Advertising, Marketing & Media publications. It's free and it condenses important industry related news to one email." AdForum.comAn information provider focused on the global advertising industry. They partner with the trade press in over 10 of the largest advertising markets around the world and also have partnerships with the industry’s top festivals and award shows. Advertising Educational Foundation (AEF)FAST FORUM: To help students understand the roles that exist in the industry, AEF in partnership with Hearst, has developed a series of short films to provide a deeper look. These interviews provide first-person insight into how the industry works to help you find the right path. Adzuna: Awesome jobs and great companies. Have a look. Minority Advertising Internship Program: MAIP Named Top 2017 Diversity Summer Internship Program By BlackNews.com! New York Women in Communications (WICI): Their purpose is to strengthen the role of women in all communications professions. This site is a great source of internships in Advertising, Multimedia, Books, Newspapers, Corporate Communications, Photography, Film/TV Public Relations, Radio, Fund-Raising/Development, Graphics/Illustration, Sales/Marketing, Internet/New Media Special Events, and Magazines/Publishing. Industry Blogs: Another great way to keep up with the advertising industry is by reading blogs. copyranter There is a lot of really useful stuff in the archives as well. Gods of Advertising The tagline for Steffan Postaer’s blog is “We make you want what you don’t need” Seems to sum things up quite well! Holmes Report All about PR! Dedicated to proving and improving the value of public relations, by providing insight, knowledge, and recognition to public relations professionals. provides the most sophisticated reporting and analysis of public relations trends and issues, along with an extensive global footprint of events and awards. Media Village - The leading site for search, original journalism, thought-leadership and native content serving the media, advertising, marketing and entertainment communities. PR Daily from an alum, "Ragan's PR Daily News has something worth my time and it's even better for young professionals." PRWeek The leading trade publication for the public relations and communications industry. Are you a wordsmith? Have natural curiosity? Do you thrive when presented with deadline driven tasks? Journalism may be the perfect career for you. It allows you to research a wide variety of topics and data, study and analyze them, and then write a narrative. Sounds like an academic exercise, right? Ideally, this is how a journalist operates. A broadcast journalist works in radio, television or online (multi-platforming), researching and collecting stories and writing them up for reporting in news bulletins and other programs.. Broadcast journalists can fill a number of roles in the production of a program including an editor, reporter, presenter/news anchor, producer, and correspondent. The National Association of Broadcasters (NAB) is a full-service trade association which represents the interests of free, over-the-air radio and television broadcasters. CBS News Educational Internship Program internships in journalism, broadcasting or production. ABC News Internship Program internships in broadcast journalism. Internships at National Public Radio (NPR) are designed to provide students and recent graduates with an opportunity to learn about broadcasting and the supporting areas of NPR. New York Women in Communications Their purpose is to strengthen the role of women in all communications professions. This site is a great source of internships in Advertising, Multimedia, Books, Newspapers, Corporate Communications, Photography, Film/TV Public Relations, Radio, Fund-Raising/Development, Graphics/Illustration, Sales/Marketing, Internet/New Media Special Events, and Magazines/Publishing. Investigative Reporters and Editors, Inc. (IRE) provides educational services to reporters, editors and others interested in investigative journalism and works to maintain high professional standards. The American Society of Newspaper Editors (ASNE) is a membership organization for daily newspaper editors, people who serve the editorial needs of daily newspapers and certain distinguished individuals who have worked on behalf of editors through the years. JournalismJobs.com is the largest and most-visited resource for journalism jobs. Search for jobs in newspapers, wire services, television, radio, and online media. Knight Foundation Future of Journalism Report - Very informative read and the foundation does some great other work too. Mashable - came highly recommended for news and job postings in social media. MediaVillage - The leading site for search, original journalism, thought-leadership and native content serving the media, advertising, marketing and entertainment communities. Ephs Sports Journalism. Looking for an experiential learning experience? http://spotlightoncareers.org/career/social-media/ - Includes an excellent section covering an overview of this type of work, internship and job information, resume advice, and alumni profiles to get a sense of the type of work. There is something special about being involved in the creation of a book or magazine; at least that’s the way people in the publishing world think about their work. If you enjoy the printed page, the look and feel of a book or magazine; if you are an avid reader, appreciate a well-written sentence, have fun proofing or editing other people’s writing, read the New York Times’ Book Review first on Sunday mornings – you may really enjoy the world of publishing. There are other jobs within the publishing world that can be equally captivating. The roles of the book designer, the production manager, the marketing team, and the publicist all have an important place in the success or failure of a book project. So, if you love books and magazine, perhaps you should consider a career in this interesting field. Please come to talk with us and we’ll work on your plan for learning more! Bookjobs.com An excellent source of information. Ed2010.com A terrific site for magazine publishing. Mediabistro.com Nearly everyone we have spoken within the industry has mentioned this site as a top source of industry news and job leads. The Writer -Monthly magazine with how-to tips and freelance writing opportunities. Publishing courses are not required to land in publishing, but they can be a good stepping stone. They provide a foundation of knowledge and usually have strong ties to editors in the industry. It is important to know that in order to get a job in journalism, you do not need to have an undergraduate major in journalism or a graduate degree in journalism. However, since the job market in journalism is extremely competitive, students without any experience in print or broadcast journalism may want to consider this option.